This course is great if you want to learn to create music to an advanced level, and in a wide variety of ways. You’ll benefit from world-class teaching, and unlimited access to our high-end studios. Our technical support staff are always on hand to help. First you’ll study music production and advanced areas of sound design, mixdown and mastering, so your tracks will be at a releasable level. You’ll then move onto audio engineering, which will equip you with a technical skill-set you can apply to a range of roles in the music industry. You’ll record an EP, create sample packs, and write music for visuals such as film. If you want a solid understanding of music production and where it can take you, this course is for you. In a creative environment with expert tutors, you’ll progress step-by-step. Go from a beginner, to using Ableton Live and Pro Tools like a pro. Music Composition. Don’t worry if you don’t know music theory. Don’t worry if you don’t play an instrument. This 3-month module will help you arrange and create music confidently. We have a strong network of music industry opportunities. As your skills develop, this will help you make the jump from studying to working. Music Production and Audio Engineering: 1x6hr daytime or 2 evening lectures (18 months). Music Composition: Mon or Wed 7pm-10pm (3 months). The introduction to music production module will give you a strong grounding in music production skills using Ableton Live – arguably the most immediately creative DAW on the market. You’ll learn how to work with MIDI and audio, virtual instruments, MIDI controllers and effects: techniques, which will be built on as the module progresses. A variety of styles are studied, along with basic sound design with Native Instrument’s Komplete instrument selection, structuring different genres, and mix down techniques to turn your track from an arrangement into a finished, polished piece. If you’re serious about becoming a successful music producer, audio engineer, or DJ/producer, then this module will teach you essential skills for success in a competitive market place, and gives a solid platform for those looking to move on to further advanced study. We’ll show you how to get the most from your home studio setup, and how to incorporate hardware instruments and a mixing desk into your workflow if this is a direction you’d like to take. Whether you’re new to music production or have been already producing your own music for a while, you’ll be learning all the essential skills in an creative environment, from industry active expert tutors with a wealth of releases and remixes under their belts. school of electronic music is an Ableton Certified Training Centre and a Native Instruments Training Partner. Ableton Live workflow, MIDI sequencing, audio sample import and editing, Native Instruments Komplete overview, music computer setup and specifications, MIDI controllers, audio interfaces. Critical/analytical listening skills, common production techniques, basic synthesis/sound design, remixing skills, how to structure music of different styles/genres. Modern mixing desk connectivity, functionality and signal flow, correct monitoring practice, using hardware synthesisers and effects, audio routing and recording. Balance, panning, EQ, gates, compression, creative modulation effects, reverb and delay, basic mastering techniques. Why is the Electronic Music Composition Online Module automatically added to all courses? How do I start and finish a track? How do I make a groove & arrange beats? How can I create a track, with a sample as a starting point? What is a chord structure? How do I know if this vocal is in key? How do I make a better breakdown? How do I write a hook? How do I finish my arrangement? How can I get creative when I open Ableton Live? This online module will answer and teach you all these techniques, and more. The keyboard, bars & beats, tempo, analysing music, music theory, keys & scales, basic chords, extended chords, inversions, acapellas, automation, structure, creating hooks, song sections, arrangement, song templates, audio sampling, working out key. The advanced music production module is an ideal progression for those who have completed the Introduction to Music Production module. This module is for those who already have a working knowledge of music production using a DAW. It is not DAW specific, and focusses instead on transferrable music production techniques relevant for any platform. Are you already producing, but often feel that something is lacking from your music? Then this is also the module for you. The Audio Engineering module is an ideal progression for those who have completed the Introduction to Music Production, or Advanced Music Production modules, or one of our shorter courses such as the Ableton Live Short Course. This module is beneficial for those who already have a working knowledge of music production using a DAW and is suitable for those wanting to expand on the opportunities that their music production skills can give them. If you are new to making music in it’s entirety, this module can be studied as a standalone course but be prepared to put the hard work in with your practical time right from the start. Delivered on the industry standard Pro Tools platform across a range of high-end studios using the latest SSL, Midas, RedNet, UAD and iZotope technology, you’ll learn a wide range of practical skills required for employment in many different areas of the audio industry. Whether you’re a music producer looking to broaden your skill-set and scope of your own work, or you’re looking for a viable way to earn a living and carve a career in the industry you love, this is the module for you. The module provides a series of real-life scenarios in which those working in the audio industry may well come across, giving the students opportunity to apply their learning in a practical way. For example, students will learn to follow briefs, in order to create radio adverts and score music to film – all elements which can be compiled to create a strong showreel for their future careers. Learn from industry active producers and engineers who have achieved a huge range of releases and credits to their name. Pro Tools workflow, digital and analogue desk connectivity, functionality and workflow, patch bays, studio outboard, cables and connectors, studio monitoring procedure, foldback and studio maintenance/etiquette. Microphone architecture, selection and placement, multitrack recording, editing/comping/correcting audio, UAD mixing vs hardware compressors, EQ and effects, recording a range of different instrumentation, mixing techniques and methodologies. Create a sample pack, record and produce a full band, score and create music for other media such as video games, film and radio, and ADR (dialogue replacement) for film. It’s suitable if you haven’t got any music qualifications, or don’t play an instrument. The course is not genre specific, we don’t mind what sound you want to create. 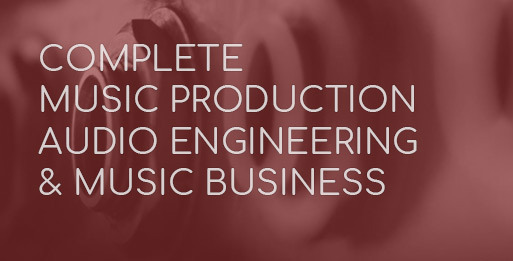 We’ll help you develop to a stage where you can send your music out to record labels. You’ll also be able to record others to a very high standard, and sync music to film. You’ll be able to create sample packs, and have a strong portfolio to apply for work in the music industry. None. Suitable for beginners or self-taught producers. No software, equipment at home or prior qualifications needed. Add the Business module to increase your opportunities. You’ll finish producing music at a very high level. You’ll also have a studio engineering skill-set and understand music theory and synthesis in detail. Music Composition is studied alongside your Music Production module unless otherwise specified. Contact us for full timetable with regards to Music Composition, Music Production and Audio Engineering. from 12 – 48 months, from £161 per month. Option Five: Reg fee (£300) to enrol + £6415. Total £6715. + 6 x 10 week instalments of £1150. Total £7200. In short: enrol as soon as you are ready. All live course dates are available for you to enrol on. Unlike most training centres SEM has a limit on lecturer to student ratio and keeps its class sizes small. We therefore have limited availability and courses fill up in advance. We would recommend enrolling as soon as you are ready, to avoid disappointment. If you are looking at a start date that is more than 3 months away, we would strongly recommend contacting a course advisor so that we can primarily secure your place before the window opens for you to apply for finance/PCDL. Apply online now via the course page. The initial downpayment is paid to SEM, this is not required until 14 days before your course start date. Speak to to the SEM office asap. We can take the initial downpayment to hold your place on the course until we are within the 3 month window for you to apply for the finance. If you have any questions please contact a course advisor on +44 (0)161 833 4722. They will be happy to help! If you have any questions, we would always recommend contacting a course advisor or calling us on +44 (0)161 833 4722. You can apply for the full amount of course fees, and choose an affordable monthly repayment that suits your budget. Other benefits of student finance are that the baseline course price is based on our ‘advanced’ cheaper price. You will need to pay a minimum 5% downpayment on the course fees at the point of successful application, although you have the option to make anything up to a 50% downpayment on course fees (please contact SEM for this). Or, enrol on SEM’s flagship ‘Master Diploma‘ and receive both Ableton and K12 free. Your timetable can be tailored to suit your needs. Modules can studied one after the other, or at the same time. Do I get any student discounts? Discounts off musical equipment (speak with us about this) including 40% off Ableton Live and Native Instruments discounts. For this particular course, we will also give you either Ableton Live Suite or Native Instruments Komplete for free once we have received your full course fees. If you are on an extended payment plan and would prefer your free software earlier, you can claim it with a £200 deposit which is returned upon completion of course fees. Yes, SEM guarantees more practical time than any other UK equivalent. Practical time is allocated to you (flexible to your schedule) which goes alongside your lectures. We believe access to high-end studios and support from a knowledgeable technical support team is absolutely key in helping you develop to a professional level. Your study is broken up into approx. 6hrs of weekly lectures (fixed time every week, see ‘what is my timetable’ tab), individual studio time (flexible to your schedule) and additional unlimited access, along with having lots of online course resources to continue learning at home. So as long as the lecture time doesn’t clash with your other commitments it is totally possible to study this course alongside full-time work. If you have any questions please contact a course advisor on +44 (0)161 833 4722. If you need advice on what headphones to purchase, please contact a course advisor on +44 (0)161 833 4722. Every student has access to their own iMac workstation in the school which contains all the software, samples and plugins that you will use throughout the course. Specifically on this course, Ableton Live Suite or Native Instruments Komplete is included for free with your training for you to install at home if you have a PC/Mac, although a home computer is not immediately essential for training. We cannot provide you with a Tier 4 Licence. Do please still contact us so we can notify you when this is in place. You can however apply for a Short Term Study Visa to enable you to study for up to 6 months with us in the UK. Our course advisors can look at the timetable so that a longer course can be condensed into a 6 month period for you to still receive the full training in a shorter time period. We do indeed hold Open Days! You can see the next available date and sign up for it here. Please contact a course advisor on +44 (0)161 833 4722 to make an appointment for either a tour or the Open Day. If you have any questions, please contact a course advisor on +44 (0)161 833 4722 who will be happy to help!